'Dual folded line' Transmission Line? Can I build two separate folded tapered transmission lines into one cabinet, and can I drive an 8" and a 5" driver from a single amplifier channel without a crossover? I’m looking for opinions on the possibility of building a transmission line speaker with two separate folded lines inside the cabinet. I recently completed a long-running project to build a complete system myself, using a miniDSP 2x4 balanced system as the heart of my pre-amp, a Hypex 4-channel power amplifier and a pair of M3tlm speakers built from plans and components bought from IPL Acoustics. To my ears this is the best setup I’ve ever owned, and I love the sound of the M3tlms. The Hivi/Swans M5N 5” drivers give good strong bass from 40Hz up (thanks to the TL), and the Hivi/Swans RT1.3 ribbon tweeters give real sparkle up to beyond my hearing range. 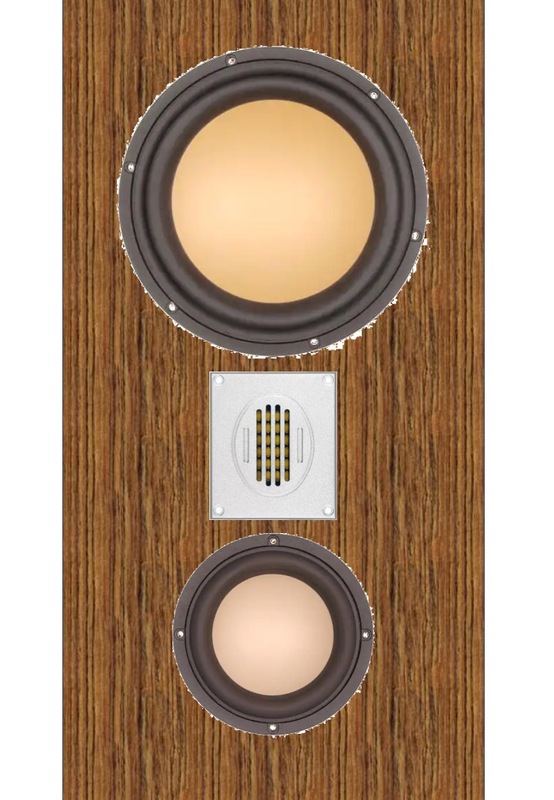 Having finished the system I’m at a loose end, so I’m considering designing and building my own TL speakers, and I’m aiming for even better bass. I have a spare set of M5A 5” drivers (like the M5Ns only with a cast chassis), and a spare pair of the RT1.3 ribbon tweeters, so my thought was to add a pair of matching M8A 8” drivers (I do like the copper driver colour! ), and build a cabinet to take all three drivers. Having looked into the principles of TL cabinet design, I realise that a parallel-sided cabinet does not lend itself to a smoothly tapering folded line - at best I think you will end up with several discontinuities in the taper, or maybe some triangular/wedge filler panels. So I considered tapering the sides of the cabinet, but then I realised that the space that might be wasted by those triangular filler panels in a parallel cabinet could be used to accommodate a second folded line. So whereas my original idea was to build a line to suit the 8” driver, and include a sealed or ported enclosure within the cabinet for the M5A and the tweeter, I’m now wondering if I could incorporate tapered lines for both the 5” and 8” drivers in the one cabinet. I sketched it out and it seems feasible - I’ll post the sketch later. I do realise that the addition of the 8” driver means I don’t really need the bass extension properties of the transmission line for the 5” driver, but the opportunity is there, and I think the peak of the extended bass from the 5” driver could slot nicely into the gap left by extending the 8” bass. If I taper both lines I should be able to optimise them separately for each driver, and it should minimise complications from higher harmonics. Some miniDSP magic should be able to balance the contributions from both drivers. So that’s the first question - are there any obvious pitfalls or problems with trying to build two tapered lines into one cabinet - will they tend to interact perhaps? The second question concerns crossovers and amplification. I do have another 6-channel AV amp, but I’d need to find a way to split my stereo source up for the six drivers. A miniDSP device seems like an option - perhaps a miniSHARC+miniDAC8. But I’m wondering if it would be a sin to feed one 8” and one 5” driver from the same amplifier channel, which would allow me to get away with using my existing 2x4 miniDSP board and 4-channel amp. I’d then let the miniDSP EQ deal with any unevenness where the two drivers overlap. Is there any problem feeding the bigger driver with more mid range frequencies than it can reproduce, and the smaller driver with more bass than it can reproduce? Last edited by ChrisHill; 23rd January 2018 at 11:49 AM. You certainly can use a pair of TLs. 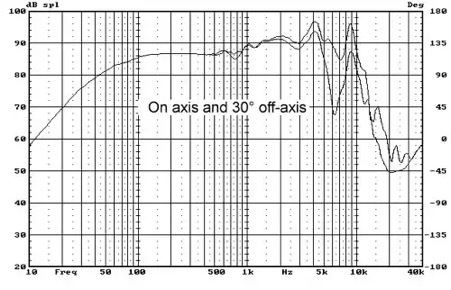 I used a pair of mass-loaded lines for two 7-inch woofers in my 3-way TuLines design quite a few years ago. These obviously aren't tapered which makes them easier to implement and build, and the midrange driver I used was a dome, not requiring a separate enclosure (or another TL for that matter). I've attached a scanned side view drawing of this design in case it might help. This has been done commercially. From memory Castle Acoustics (British company) made a model called the Howard. It had 2 separate lines with one forward firing unit and one upward firing unit (plus a forward firing tweeter). The lines were tuned to different frequencies. Received very good reviews. 1970s/80s I think. I did a quick and dirty mock-up based on line lengths that suit the M5A and the M8A. Even though the line tapers are a long way from being right in this drawing it seems doable, and won't make for too big a cabinet. I mocked up the top of the front panel to show which driver goes where. Putting the tweeter above the M5A allows me to locate the M5A at a small offset from the end of its line, which all helps with the higher harmonics. 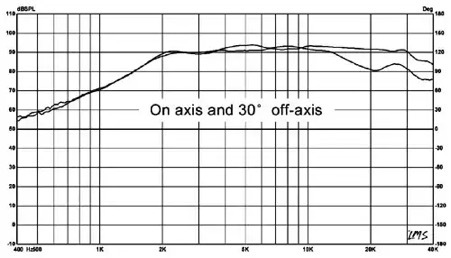 Looking at the responses of the three drivers I think I can answer my own question about the 5" and 8" drivers sharing an amplifier channel without a crossover. It's not going to work. 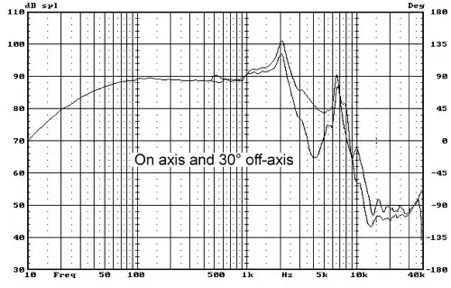 The tweeter needs a crossover above 2.5kHz, and the 8" driver seems to have a bit of peak at 2kHz, starting at 1kHz, which I'm guessing I should probably avoid. So I'm going to need to use the 5" driver to bridge the gap between these two, so I'll need two crossovers per cabinet, hence 6 channels of amplification. I advise ditching the "small spoon" here. In more concise terms, I'm not certain I understand the need for an overly complicated acoustical scheme when the setup will be active. A folded line for the 8" is fine, but of no use for the 5". It will not achieve anything the DSP can't do better and might only hurt midrange performance. Were this a passive setup, I could advise a short damped line to flatten the impedance of the 5", but this is of no consequence as the driver will be directly connected to it's own amp channel. If you want to get away using only your 2x4 miniDSP, perhaps bi-amping the 8" + 5" as two channel, while going passive on the tweeter on a third channel (easier to pad down electrically and likely fewer/cheaper passive parts) could work. This would allow the DSP to take care of a fairly low frequency Xo as well as BSC and woofer/midrange level adjustments and time alignment. Last edited by IG81; 23rd January 2018 at 08:45 PM. I advise ditching the 8" driver's spooning partner. And you managed to nail-quote my pre-edit quip. Is this a quantum-physics expert speaking....? Haha, yes, my sketch does look a bit 'suggestive', I agree, but I figured there are worse TL designs out there. But I think you're right - I'm over-complicating things. But I'm a complete novice at designing speaker enclosures, and only one build up from that as a builder. So if I'm going to use the 5" to just bridge the gap between the 8" and the tweeter, what's the best way to go about that? Should I just include a sealed enclosure for the 5" and the tweeter, or is a ported design better? @IG81 - Can you explain the use of the miniDSP 2x4 again? I don't get what you're suggesting. Are you suggesting I treat them as a single driver - if so how do I handle that nasty looking peak in the 8" response curve between 1kHz and 2kHz? If that's not what you're suggesting, then wouldn't splitting them up use up all four of my miniDSP channels? Where would I get a signal for the tweeters? Last edited by ChrisHill; 23rd January 2018 at 09:29 PM.